Xerosun's Fiachra Kelly and Gareth Jeffs have signed an endorsement with Polish hand made guitar manufacturer Mayones. Both members have been long-time fans of the guitars and were delighted with the endorsement deal from the guitar manufacturer. Xerosun's debut album "Absence Of Light" was recorded using their custom Mayones 7-strings guitars. 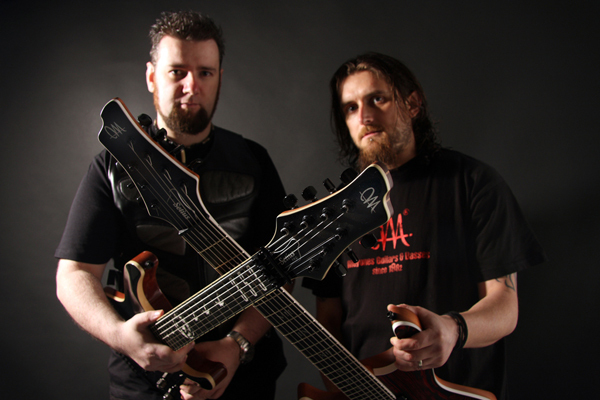 Xerosun's Fiachra Kelly and Gareth Jeffs holding their custom Mayones 7-string guitars. Fiachra's Setius Pro 7 - "Raven 353"
Fiachra's custom built Setius Pro guitar was nicknamed the "Raven 353" because of it's bespoke inlay designs. The numerals "353" adorn the first 3 frets of the guitar; and we are told this is Fiachra's lucky number! The fret inlays are Ravens, the translation of "Fiachra" to English, and they adorn the ebony fretboard until the 12th fret, where Xerosun's blade logo is found and the body is a Translucent Black Burst Matt finish. "My custom Mayones Setius Pro 7 is perfect for my needs with it's crystal clear low end, great mid tones, and superb playability - it is core to the Xerosun sound. 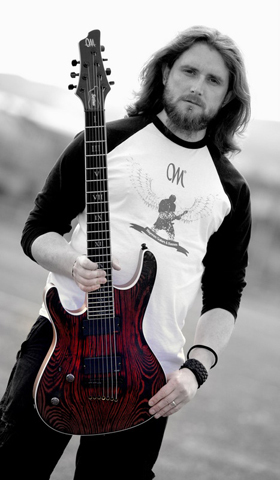 I would recommend Mayones instruments to any Musician!" Floyd Rose 7-string Tremolo bridge. Bridge Pickup: EMG 817, Neck Pickup: 707TW. Ivory binding on the headstock, neck and body. Translucent Black Burst Matt finish, with all black hardware. 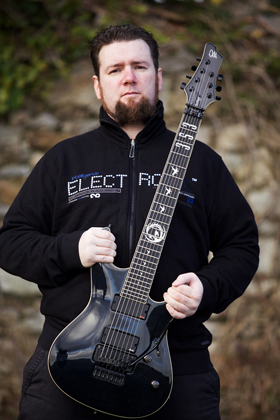 Gareth opted for the 7-string fixed bridge model of the Setius series, and it is his second guitar from this range by Mayones. The body of Gareth's Left-handed 7-string Setius features one of Mayones new custom coloured Matt finishes. Gareth chose the Monolith Red Grain Ash Matt finish, white binding on the body, neck and headstock. The ebony fret board has a unique custom inlays of roman numerals for the major fret markers, down to the 24th fret. "An absolute Godsend - Not once have I seen a Guitar so well crafted. The second I opened the case I was in awe, and quickly found it was a joy to play - The Sustain and brutal Low end is just magic!!" White binding on the headstock, neck and body. Monolith Red Grain Ash Matt finish. 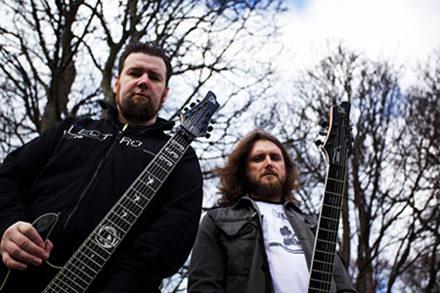 Xerosun's Fiachra and Gareth display their custom Mayones 7-string guitars.